meatloaf is a favorite of matt and mine. i have played around with many recipes and this is the one i keep coming back to. we love it because it's simple and classic, and yields great results every time. i have no doubt i'll keep my eye out for other promising renditions, but for now, this is it. in a medium saute pan, over medium-low heat, cook the onions, olive oil, salt, pepper, and thyme until translucent, but not browned, approximately 15 minutes. Add the worcestershire sauce, applesauce, and barbecue sauce and mix well. allow to cool to room temperature. combine the ground turkey, bread crumbs, egg, and onion mixture in a large bowl. 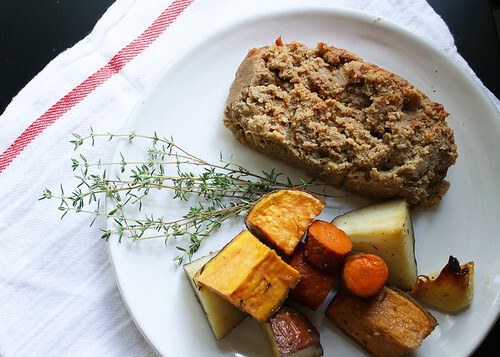 mix well and shape into a rectangular loaf on an ungreased sheet pan. mix together topping and spread evenly on top. bake for 1 1/2 hours until the internal temperature is 160 degrees and the meatloaf is cooked through. serve hot, at room temperature, or cold in a sandwich.